Spring is in the air… and on the shelves at the Calgary Farmers’ Market! May is the month for greens, fiddleheads, peppers, rhubarb, zucchini, greenhouse crops… and of course – asparagus! We thought we would highlight this spring favourite in a simple risotto dish. 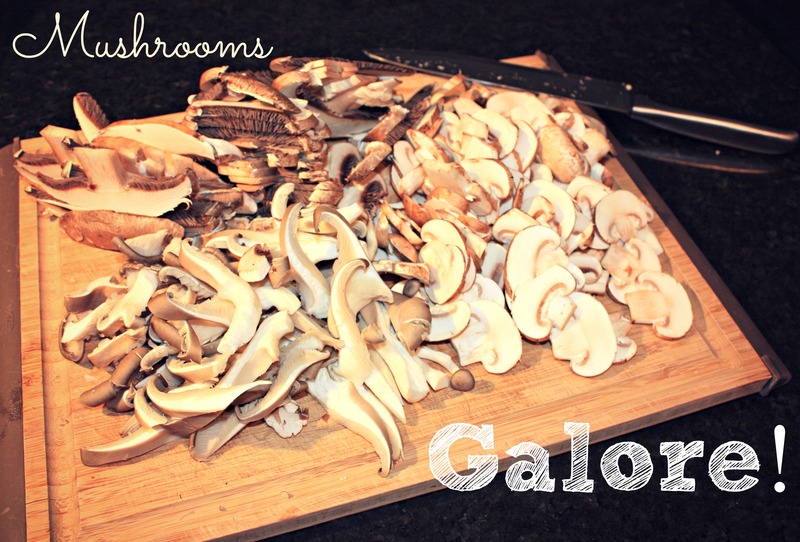 You can always leave the mushrooms out if they’re not your favourite, or substitute another seasonal veggie in their place. This recipe requires a little bit of separate prep for the main ingredients, but then it all comes together in one pot for the grand finale! First, you’ll need to heat the stock up in a small pot. Once hot, turn the heat off and set the stock aside until needed. I used a nice homemade chicken stock from my freezer, but you can always pick up delicious stock from the Stock and Sauce Co. at the market! 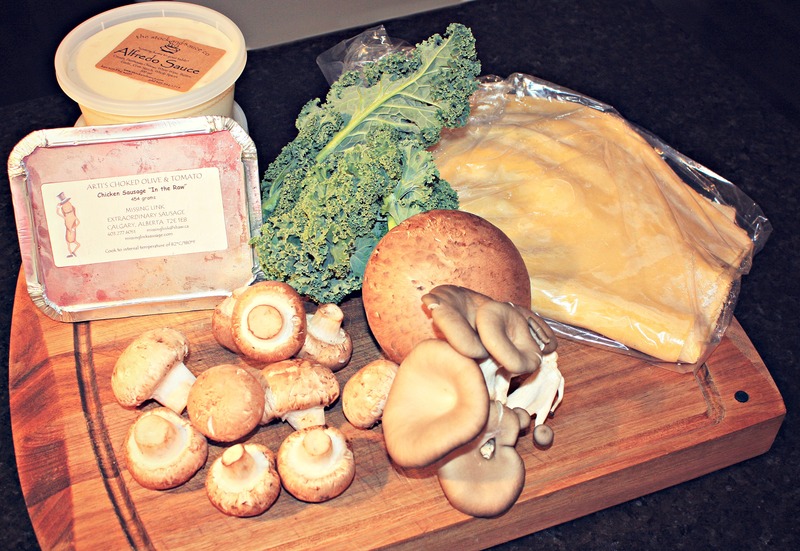 While the stock is warming, heat a pan with half the olive oil and sauté the mushrooms. 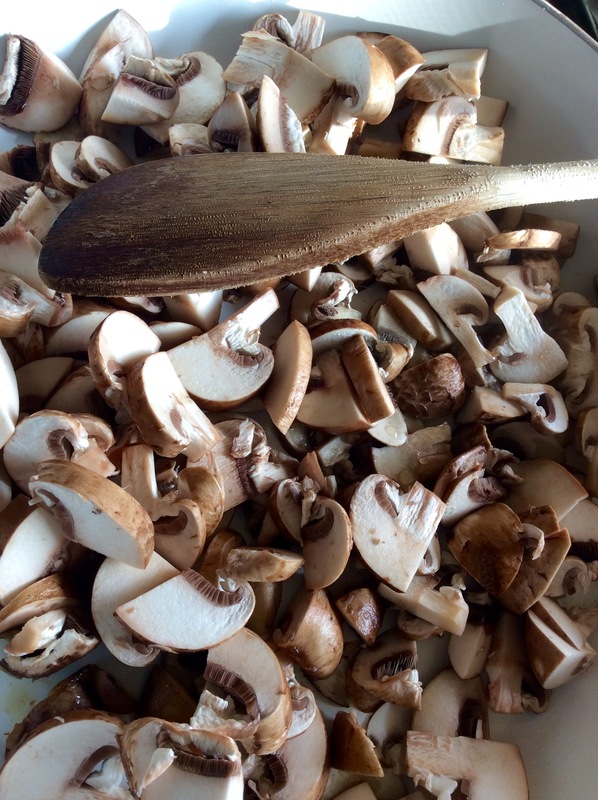 Get the mushrooms nice and brown and delicious, and then remove from the heat and set aside. Heat the remainder of the olive oil in a large pot, add the onions and cook for about 5 minutes. Add the rice and allow to toast slightly. Now you can add your minced garlic and cook for 1 minutes. At this point, add the wine and give everything a good stir until the liquid is almost entirely evaporated. The key to a good risotto is to add liquid gradually, and keep cooking it down before you add more. So start with about 1 cup of hot stock, add it to the mixture, reduce the heat and stir. Continue to stir every couple of minutes while it reduces. Add more stock as needed, about a cup at a time. The rice will absorb all the delicious stock as you go and develop that signature creamy texture that risotto is known for. While you’re waiting and stirring, chop the asparagus into bite sized pieces, grate the parmesan, and zest the lemon. Set everything aside until needed. When you’ve added all the stock, and there is still some liquid in the pot, add the asparagus pieces so they have time to cook. Once the asparagus and the rice are cooked to your liking (add a bit of water if you run out of stock), add the cooked mushrooms, chives, lemon zest, butter and parmesan and fold in to the mixture. All that’s left to do now is to season the risotto with salt and pepper as required. 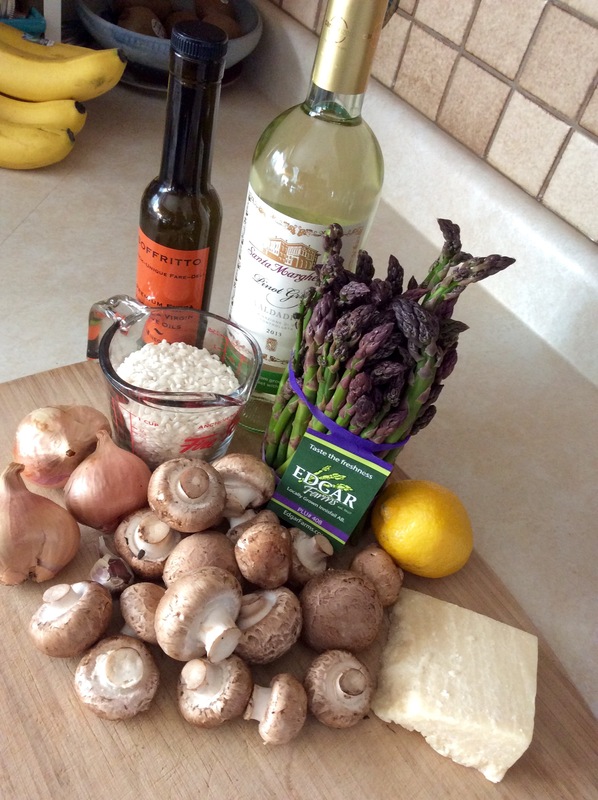 This asparagus mushroom risotto could be served as a side dish, but it’s perfect on its own as well. The asparagus season is short, so get your fill while you still can at the Calgary Farmers’ Market! It’s definitely the time of year for comfort food – stews, soups and anything else that’s warm and hearty. Slow cookers and big soup pots are in full rotation around my house right now, but I thought I’d try something new (for me) and cook up some beef short ribs. These ribs were a showstopper right out of the gate, and I couldn’t wait to cook them up! 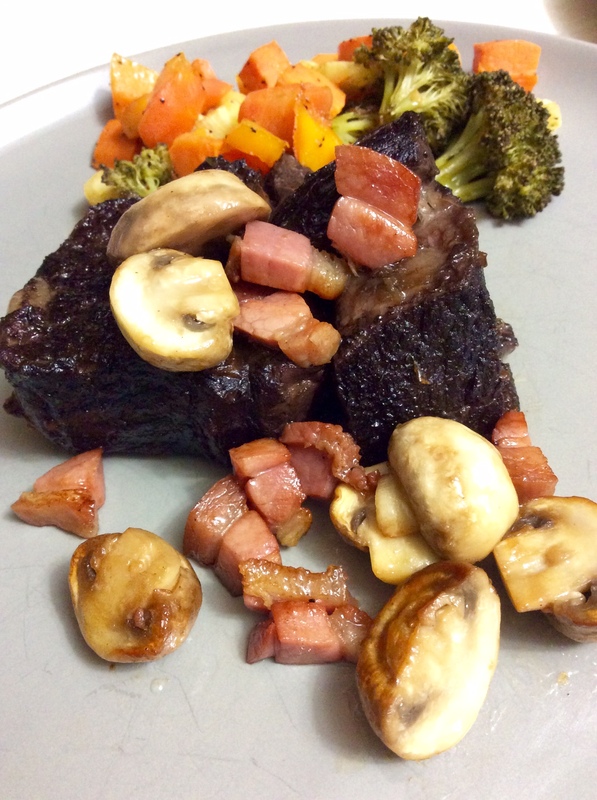 Silver Sage Beef provided some beautiful short ribs for this recipe. When slow cooked, this particular cut of beef becomes a tender, falling-off-the-bone, melt-in-your-mouth delight! Alright, the first thing to do is preheat the oven to 350 degrees. This dish starts on the stovetop and ends in the oven, so choose a pan or Dutch oven that can get the job done. Heat the pan on the stove top on medium-high, and add the olive oil. Season the short ribs with salt and pepper and fry for about 10 – 15 minutes. You’ll want them to get nice and brown on all sides. Set the halved garlic head; cut side down, in the bottom of the pan. Add the tomato paste and let it heat up for a minute or two before deglazing the pan with the red wine (use as much as you need, about 1 – 2 cups). Bring this concoction to a boil and let cook for 10 – 15 minutes until it is reduced by half. At this point, add the beef stock until it’s almost covering the ribs (the actual amount will depend on the dimensions of your pan). Bring to a boil again. Put the lid on your pan, or cover with foil and move it into the preheated oven. Cook for 3 – 4 hours, basting the ribs as you go. You’ll know they’re done when the meat is super tender and starting to fall off the bone. When the ribs look about ready to come out, fry the pancetta in a pan on the stove top until nice and crisp. Add in the mushrooms and cook until tender, about 5 minutes. Drain any excess fat. Remove the done short ribs from the oven and set aside (in a serving dish if you’re getting fancy). Scoop out the garlic and squeeze the cloves out of their skins and pass through a sieve, or mash with a fork. Strain the rest of the liquid from the pan as well and mix it with the roasted garlic. Reduce to your desired consistency by cooking it a little longer on the stove top. Now it’s just a matter of assembly! Serve the ribs with the pancetta and mushroom mixture on top. Spoon some of that sauce over the whole thing, and voila! Any seasonal veggies (which are still plentiful at the market right now) would make a great accompaniment for this dish. I ended up roasting whatever vegetables I had in the fridge to go along with this meal (carrots, squash, parsnips, broccoli). You could also serve them with a side salad or anything your heart desires. Pick up the ingredients for this recipe and others at the Market this weekend! We’ve got what you need! Fall is a beautiful time of year. It’s a particularly short season here in Calgary as we experience a swift transition between our gorgeous last days of summer, with sunny days and balmy nights to crisp mornings and see-your-breath (ALREADY??) nights. Check. And, of course, there’s always at least one good snowfall before it’s even Halloween. Check. And while the first day of winter is officially December 21st, we all know that’s a load of cr___ *ahem* cold, 4 foot snowdrifts and slippery commutes. But that makes it sound like we don’t like Winter around here, and that’s just not true. 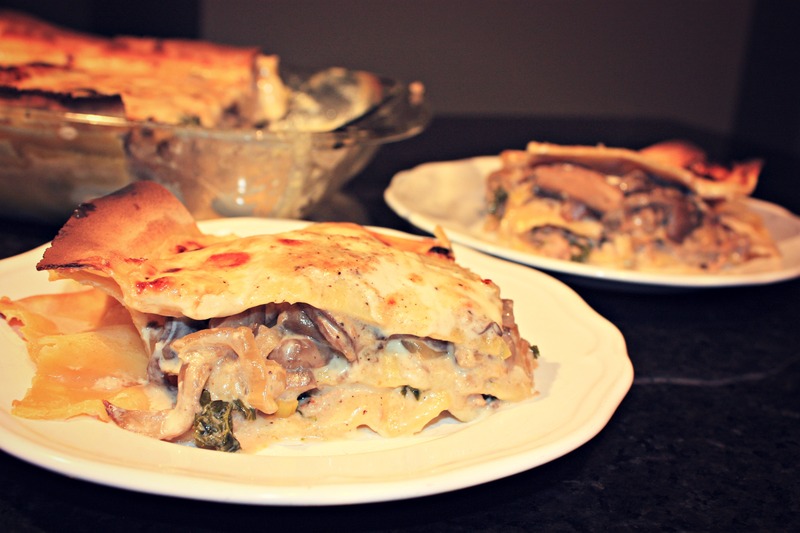 Winter is, when it’s not 40 below, a beautiful time of year filled with festivities, a plethora of fun Winter sports with cups of fireside hot chocolate, and delicious cling-to-your-ribs meals, like this Chicken, Kale & Mushroom White Lasagna. It’s perfect for a comforting dinner with family and friends and you can get everything you need in one warm stop at the Calgary Farmers’ Market. 2 containers of Alfredo Sauce from The Stock and Sauce Co.
Heat a large skillet over medium-high. Add chicken and cook, breaking up meat with a wooden spoon, until browned, 5 minutes. 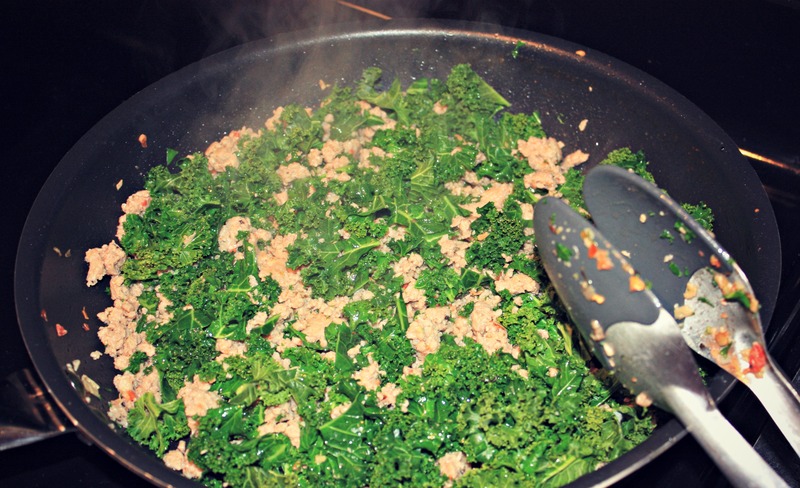 Add kale leaves with a splash of water and cook, stirring occasionally, until wilted, about 3 minutes. Season with salt and pepper. We like the addition of caramelized onions to the mushroom medley, so we added garlic and the entire onion, sliced, to a pan with olive oil and a pat of butter (using oil with the butter will prevent it from burning). Cook on low until the onions have softened, taken on a caramel color, and are sweet yet still slightly crisp. There’s no need to add sugar to your onions, just let the caramelization process happen naturally… low and slow. 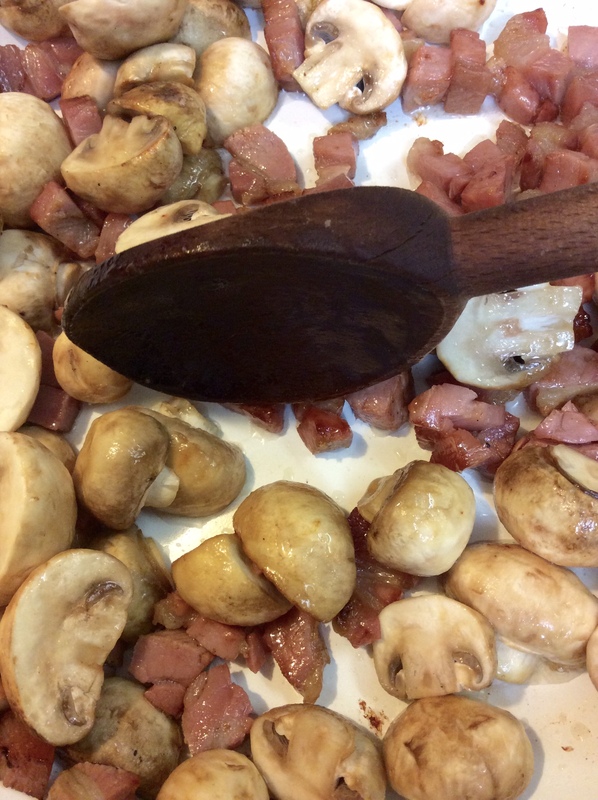 And then, in a third skillet with a little olive oil, cook the mushrooms off until soft. 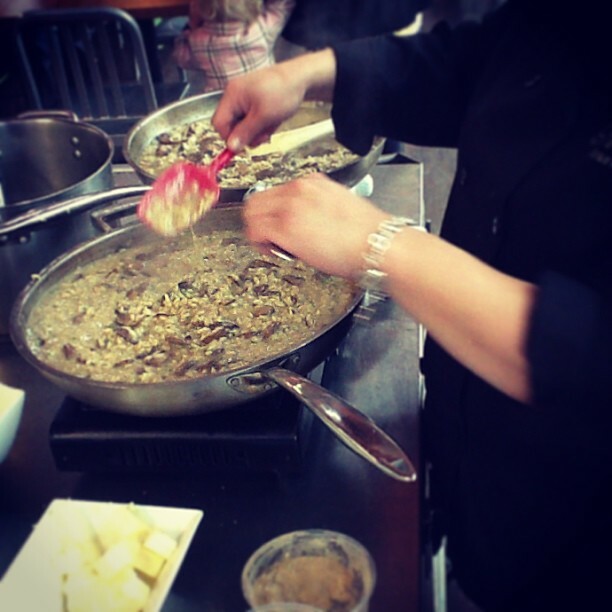 We learned a neat trick from Chef Nicole Gomes when she was at the market for an in-house mushroom risotto demo: don’t add salt to the mushrooms while they’re cooking. This will draw even more water out of the mushrooms and produce a spongy texture. Neat eh? So, just cook off the mushrooms and season with salt and pepper after removing them from the heat. Spread a ladle-full of Alfredo sauce along the bottom of a 9- by 13-inch baking dish. The lasagna noodles from Soffritto actually come in one long sheet, so you can conveniently cut them to the size of your casserole dish. Place one sheet of fresh lasagna noodles over sauce in a single layer. Top with 1/2 cup Alfredo, spooning the sausage and kale mixture over in a thin layer. This is typically where you’d add a layer of ricotta cheese, but we omitted this to lighten up the dish a bit. Repeat with a second second sheet of noodles, Alfredo, and mushroom medley layer. Top with remaining lasagna sheet, 1/2 cup Alfredo, sliced mozzarella, Parmigiano Reggiano, and freshly ground pepper and salt. Cover with foil and bake 45 minutes. Remove foil and continue baking until cheese is golden in places and lasagna is bubbling along the edges, about 15 minutes. Remove lasagna from oven and let stand 20 minutes before slicing and serving. *Note: we did not trim the noodles to an exact fit and therefore the overhanging noodles will become crisp. If you wish to remove these extra bits, just use a sharp knife to carve the excess noodles. There’s more snow ahead for us this Sunday. Now you have a twist on the classic lasagna to curl up with on a cold night. Check! Ever wondered if you had what it takes to cook like a Top Chef? Well, we’re here to help. Top Chef Canada Contestant Nicole Gomes will be demonstrating how to make a Truffled Mushroom Risotto at the market! Join us this Saturday, April 6th at 12 noon to learn how to make it yourself and enjoy a sample of her delicious dish. Find the recipe below with all sorts of delicious ingredients that can be found at the market. Heat a large fry pan on high heat, add olive oil being careful not to allow oil to smoke. Add mushrooms, sauté for 2- 4 minutes or until lightly golden brown. Turn down heat to medium high. Add chilli flakes and garlic, sauté for about 2 minutes, until fragrant. Lightly season with salt and taste for seasoning. Set aside. In a 10 – 12” sauté pan, heat olive oil and butter over medium heat. Once butter is melted add onions and cook until softened and translucent but not browned, 8 – 10 minutes. Add the rice and stir until opaque, you should notice the rice grains are translucent on the outside with a speck of white on the inside, 3 – 4 minutes. Lightly season with salt, just a sprinkle. Add the wine and stir until evaporated. One cup at a time add stock and cook, stirring until all the liquid is absorbed. Repeat this process one cup at a time, until rice is still slightly hard about 14 minutes (you may have stock left over). Add mushrooms and porcini powder, stir in1cup of stock at a time until the rice is “al dente” (not mushy, not undercooked, but still has bite), about 5 minutes. Stir in parmesan and butter. Adjust seasoning with salt and finish with truffle oil or truffle paste to taste. Finish with a Rice should be creamy and slightly moister than the consistency of porridge. Drizzle over sauce, serve immediately. If that doesn’t fix your Top Chef craving then join Nicole and all her supporters for a VIP viewing of Episode 4 of Top Chef Canada in support of the Canadian Cancer Society. Food and drink will be provided.